Fencing Adelaide. 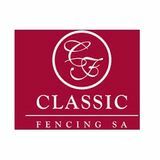 Classic Fencing is the place to go for all your fencing needs in South Australia. Talk to our fencing contractors Adelaide today on 08 8244 2258 for more information. • The fence is indeed a beautiful addition to your home, but it becomes an eyesore after some time. • The charm gets deteriorated, and you need to get a new fence. • How many years will the fence last? Well, nobody can predict it because durability depends on several factors. â&#x20AC;˘ You must inspect the fence regularly to find out the signs of damage before they become severe. â&#x20AC;˘ The blog tells you about some indications about need for replacing the fence as early as possible. When you see the boards missing or broken • Do you find some boards missing or damaged? If yes, then it is high time to call the service provider. • You shouldn’t compromise with the safety of your home. • The structural integrity of the fence also gets hampered due to broken or missing boards. • Don’t overlook the tiny holes. It could be a termite outbreak or growth of microorganisms. • Experts say that there has been structural damage happened already when you could see the holes. • Similarly, splintering or cracking of a wooden fence is also not a good sign. • t means the wood has become weak and it may fall apart anytime. 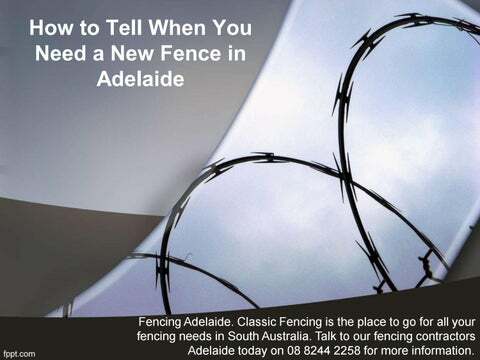 • Call a Fencing Adelaide expert and get it checked thoroughly. • If the havoc is not severe, then treatment of wood will do. When you see stains • Do you see gray or black stains on the wood? Or growth of algae or mold? • If yes, then it means you must change the fence. • The best thing is to replace the wood with treated lumber which is mold resistant. When the fence leans backward or forward • Sometimes people think that the leaning fence can be corrected by straightening it again. • However, leaning indicates that the fence must be replaced. • If you make some makeshift arrangement, then it won’t last long. What to do when you see these signs? â&#x20AC;˘ According to experts, you should call the service provider and ask their opinion. â&#x20AC;˘ There are several providers in Adelaide. â&#x20AC;˘ Repair or replace, what will you choose? If the damage is limited to a specific area of the fence, then you may revitalize it by replacing the damaged part.